Evald Okas is often considered a Pallas graduate even though he never studied at that school even for a day. That is how natural Okas’s fondness for everything Pallasesque appears to be. A certain turn in that direction is even noted in his creative work from 1955 onward: individuals also emerged alongside historical-social themes. Several summer months spent on Kihnu Island, when Okas worked actively, provided the impetus for this. His numerous portraits of fishermen are well known. He also depicted islanders in large numbers. According to art historians, this was a “lyrical intermezzo” in the creative work of Okas which becomes more picturesque and freer in terms of his brushwork. Evald Okas was 41 years old by 1958 and had been very productive, diverse and also recognised. His creative career began a couple of decades earlier, yet got into full swing in the latter half of the 1940’s. From his earlier years, Okas’s works already included figurative paintings, thematic paintings, nudes, pencil drawings, portraits, watercolours, mural paintings, ceiling paintings, various graphic techniques, illustrations, applied art, and so on. He had been very productive and his works elicited positive response for both political and artistic reasons. Okas had also been appointed as a professor at the art university four years before the completion of this work and he had been conferred the honorary title of merited art personage. Creatively speaking, Okas was first and foremost an artist who further developed the realistic trend. He drew very well and his proficiency in drawing was also evident in his paintings. In the 1940’s, he had gravitated towards literary narration in his best-known works (also in accordance with the requirements of the times). His bold and dynamic brushstrokes, realistic faithfulness to nature, bold use of colour, strong dramatisation, and much more are also pointed out. Villem Raam sees a certain turn in Evald Okas’s creative work in 1955 when Okas’s circle of themes broadened considerably: individuals came to the fore alongside historical and social themes. Several summer months spent on Kihnu Island, when Okas worked actively, provided the impetus for this. His numerous portraits of fishermen are well known. He also depicted islanders in large numbers. The subject matter of the islands, however, was also popular in the work of other artists. The depiction of coastal dwellers formed the main core of Okas’s work until 1957. The year 1958 was “wonderful” for Okas according to Raam. First of all, he discovered for himself the possibilities offered by the forms of industrial landscapes in Kunda. Thereafter, however, he returned to Muhu Island and Saaremaa. 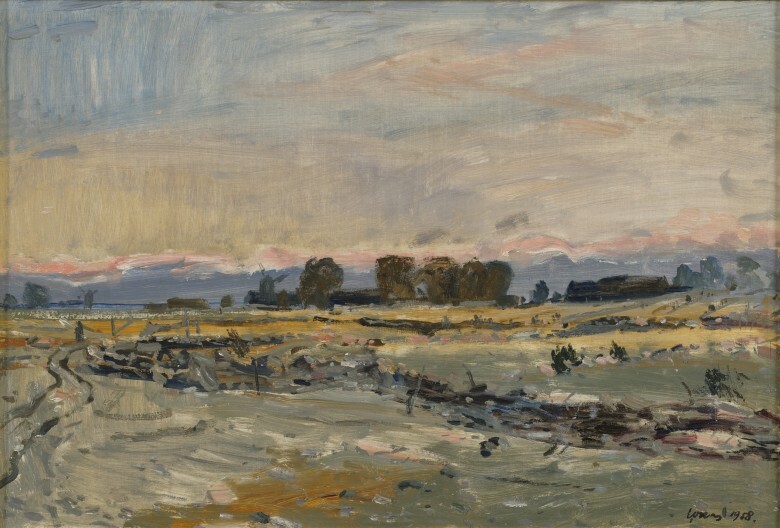 Relatively few landscapes are known from among his earlier works and the series that was completed then is one of the first of his longer series.